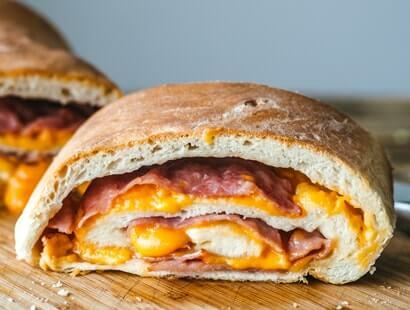 Rolled up with your choice of cheese and naturally smoked Jones ham, this calzone recipe can be easily modified to fit any menu. Thaw bread dough in large bowl, covered, until dough rises. Punch down. Let stand, covered, for 1 hour. Roll out on lightly floured surface to form 2 rectangles each about 12x9-inches. 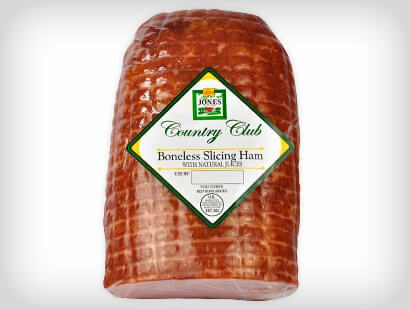 Layer half ham and cheese over each. Roll up from long side jelly-roll fashion. Seal edge and ends. Place on parchment-paper lined half sheet pan at least 2-inches apart. Bake in preheated 350°F standard oven 35 to 45 minutes or until bread is golden. Let stand 10 to 15 minutes. Slice each into 6 pieces.